HMCS Sackville is one of the top destinations for tourists along the Halifax Waterfront and across the region, and they’ve got the certificate to prove it. The last of Canada’s Second World War Corvettes, now a museum ship under the care of the Canadian Naval Memorial Trust, recently received its 2017 Certificate of Excellence from Trip Advisor. These are awarded each year based on the attractions or businesses that get consistently strong reviews from the website’s users, and Sackville has been chosen a number of years in a row. “It shows that we’re still getting good reports from guests, and we’re pretty pleased to be included in the top 10 year after year, out of about 150 sites in the HRM,” said Doug Thomas, the executive director of the Memorial Trust, after the vessel’s first fully open day of the season on June 26. Every summer, Sackville crewmembers meet visitors or cruise ship passengers who have family Naval or Second World War connections, who are military or history buffs, or who are simply moved by touring such an impressive piece of Canadian history and getting a small look at what life was like for sailors during the Battle of the Atlantic. 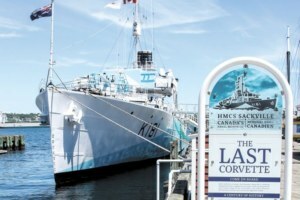 For those who aren’t planning on stepping on board Sackville before touring the waterfront, the imposing structure and its unique camouflage paint tends to capture attention, and the Trust has found the ship’s visual presence downtown is also its most effective form of publicity. “We’ve spent considerable sums through the years to advertise ourselves, but the best advertising seems to be the eyeball itself,” says Thomas. The ship is now open for tours at the waterfront seven days a week from 10 a.m. – 4 p.m., and visitors can choose to explore Sackville on their own or get a guided tour. A few keen summer students are brought on for this purpose each year and one of the Duty Trustees, normally a serving or retired RCN member, is typically on board as well.